“Tidal Basin Beach Closes,” Histories of the National Mall, accessed April 22, 2019, http://mallhistory.org/items/show/195. The public bathing beach at the Tidal Basin closed in 1925 after less than a decade in operation. This swimming area was segregated, open only to whites. Congress controlled the Washington DC budget and received increasing pressure from the African American community to create a beach for African Americans on the Tidal Basin, equivalent to the white beach. Although Congress approved funding for a second beach, debate within Congress halted progress on its creation. 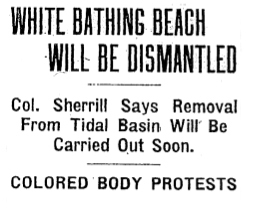 As the conflict intensified, funding for both beaches was canceled and Congress ordered the demolition of the white beach.